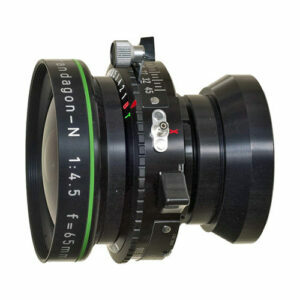 Lens Description: The Rodenstock 65mm f/4.5 Grandagon-N Lens is a professional wide angle lens for the 4x5 format, providing an angle of view on 4x5 which is similar to a 17mm lens in the 35mm format. The Grandagon-N series is an 8-element, highly-corrected optical formula known for great contrast and distortion correction.rnrnThe 105° angle of coverage permits a generous 10mm of all-direction shift on the 4x5 format, particularly beneficial when capturing a building from ground level. This lens is recommended for use between f/16 and f/22 apertures.